As my nieces and nephews have gotten older, cash or gift cards have become the favored gifts for the holidays because money always fits! I try to get a little creative in the presentation of this not-particularly-original gift, so this year I am making cord pouches that hook onto a keyring. These pouches finish at a little under 4″ from side to side, so they can easily hold a thumb drive, USB cord, some change, or even most phone chargers. Come to think of it, I may need to make a couple for myself! 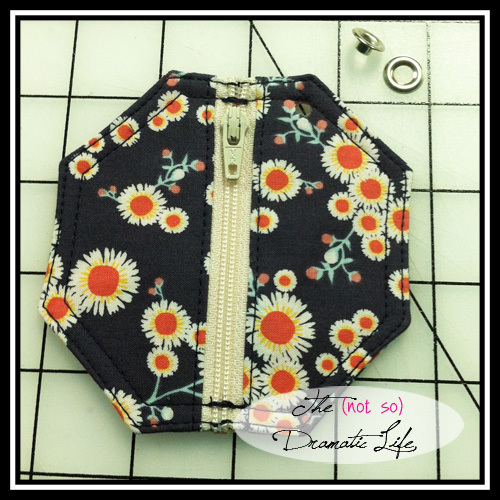 I knew that I wanted to put a grommet in each pouch to attach a key ring. (If you don’t have grommets laying about, a ribbon loop inserted into a seam would also do the trick.) I thought that the grommet would look nice in a corner, so I experimented with a couple different shapes before settling on an octagon. 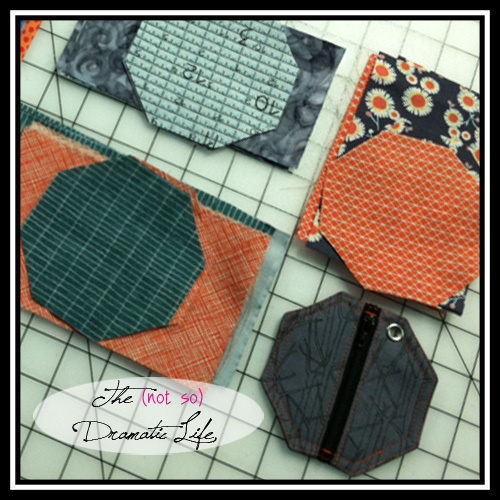 This project will work with most shapes, but if you would like to play along using the octagon, I have included a pattern here. 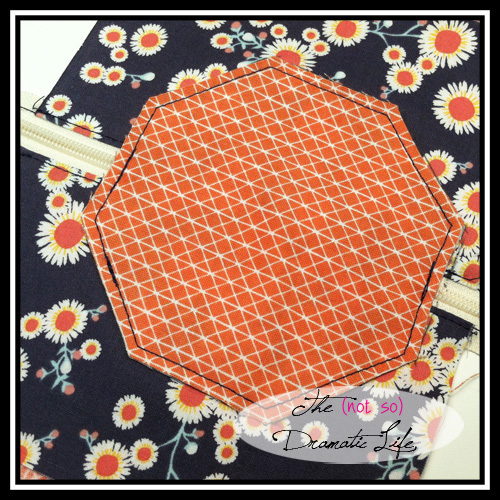 This Octagon Pattern is a PDF File you are welcome to download. I made six pouches, choosing an outer fabric and a lining fabric for each. Orange tends to be pretty popular among my nephews, so I used a lot of it this year! I cut one octagon out of each fabric, but for the front side I cut rectangles to set the zipper into before cutting it into shape. I like to give myself some wiggle room when dealing with zippers, so I cut the rectangles to about 3″x5″. 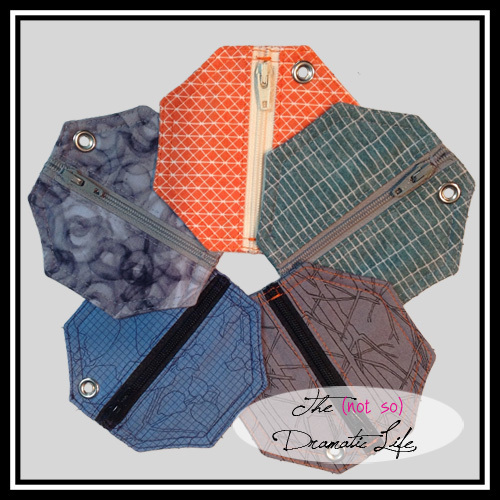 For each pouch you should have 2 outer fabric rectangles, 2 lining fabric rectangles, 1 outer fabric octagon, and 1 lining fabric octagon. 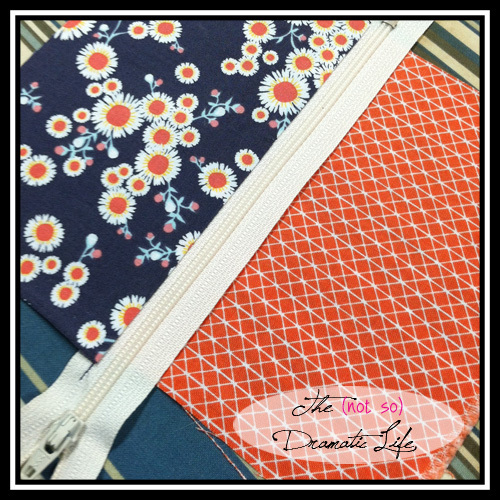 You will also need a zipper and either a grommet or a small loop of ribbon. For an exposed zipper I like to sandwich each side of the zipper between the outer and lining fabrics along the long edge of the rectangle. I like to pin the layers in place so nothing moves out of place while I’m stitching. 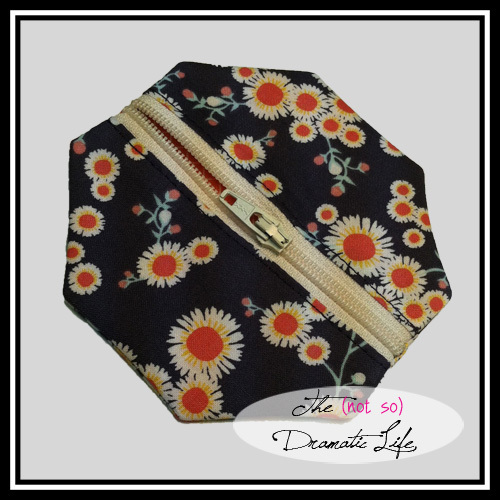 The navy floral fabric will become the outside of this pouch, so it is laying with the right side of the fabric facing the top of the zipper. 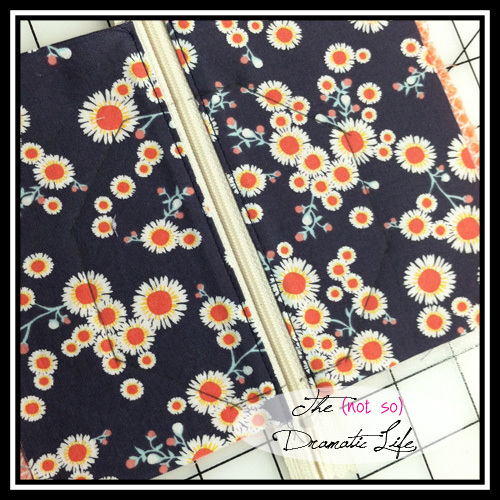 The right side of the lining fabric faces the back of the zipper. This leaves the wrong side of the fabric exposed on each side of your zipper sandwich. I like my fabric edges to line up with the edge of the zipper. 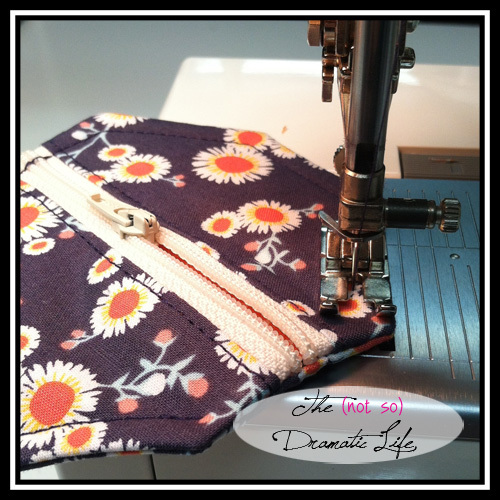 I also place the fabric in the center of the zipper so I can sew it in place without the pull getting in the way. Now you are ready to start stitching! You will want to use your zipper foot and stitch a consistent distance from the teeth of the zipper. 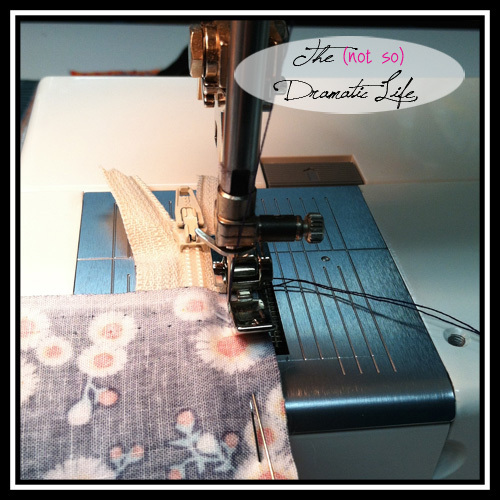 I like to line up the right side of the zipper foot with the edge of the zipper, but machines can vary, so choose a means of measuring that works for you. Now you are ready to press the fabric out to expose the zipper. I like to press the outer fabric into place first. Then you will press the lining fabric toward the back. Next you will perform the same steps to sew the remaining rectangles to the other side of the zipper. Once you have the topstitching done on both sides of the zipper, take a moment to admire your work! 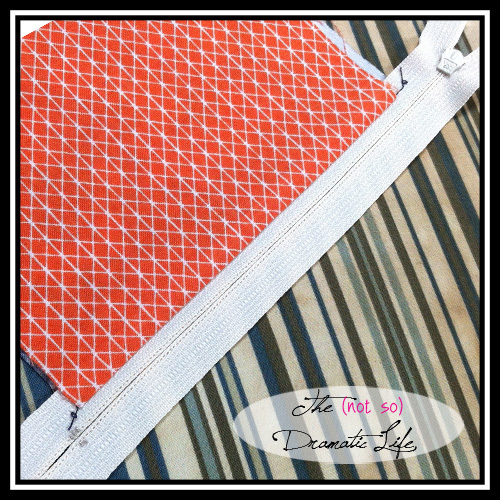 Now trace your octagon pattern onto the fabric, paying carful attention to where you want the zipper placed. 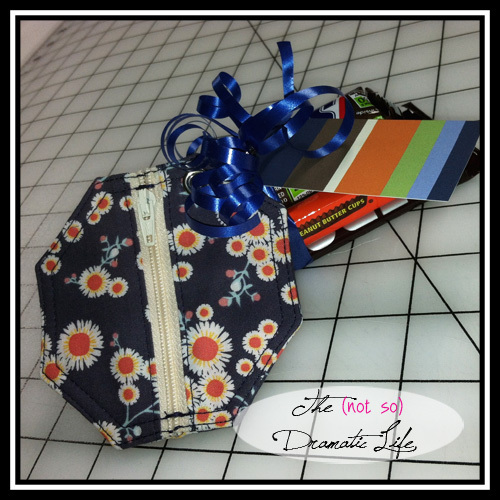 I decided to center the zipper across the octagon for this set of pouches. Do NOT cut yet! We are going to use a very small seam allowance for these pouches, so I decided it would be easier to sew first, cut later. 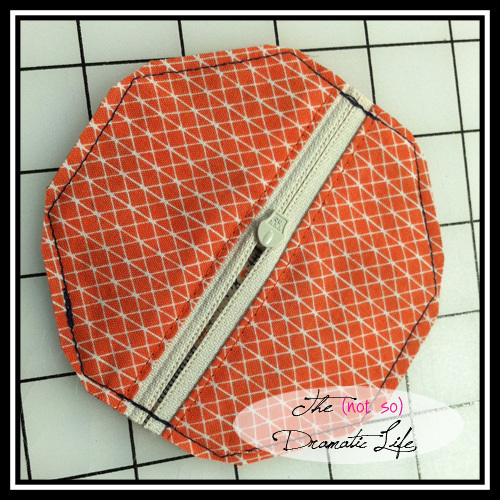 Move the zipper pull tab into the center of the octagon! (If you are going to insert a ribbon loop, now is the time. Place the loop toward the center of the octagon, with the ends sticking into the seam allowance. Pin or Baste into place.) 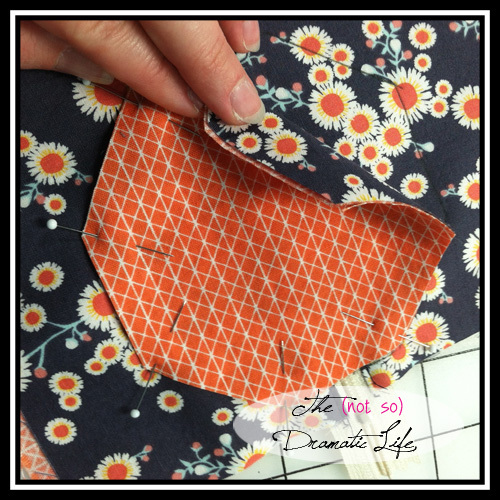 Take the octagons you cut out at the beginning of this process and place the outer fabric piece right side down onto the zippered section. Carefully line up the cut shape with the traced shape. 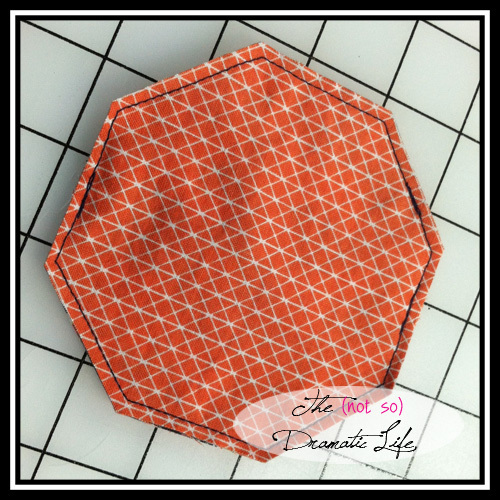 Layer the lining fabric octagon, right side up, on top of the outer fabric octagon. With the zipper pull in the center of the octagon, the cut pieces may not naturally line up with all corners. This is an instance where you should make the fabric line up the way you want. (If you don’t, the zipper may gap in an unpleasant manner.) I pin in each corner, but add as many pins as you need to feel comfortable. Check around the edges of your shape to make sure that all layers have been stitched properly. 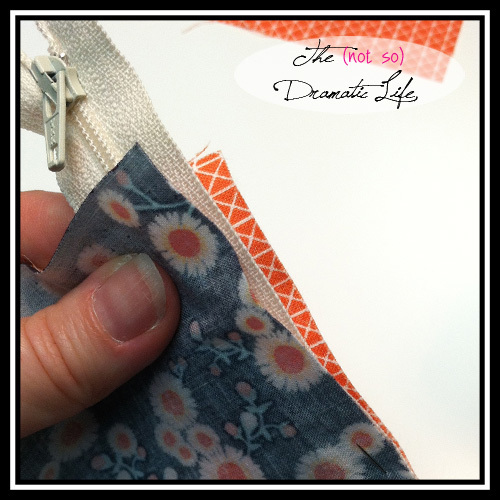 Now cut away the excess material in the zipper layer leaving the 1/8″ seam allowance. Carefully clip the corners in order to achieve nice points when the shape is turned. Turn the shape right side out using the zipper opening. Press to flatten the shape. Make sure you have pretty corners! Since we used such a small seam allowance, I like to add another row of top stitching just under 1/8″ from the edge of the octagon. 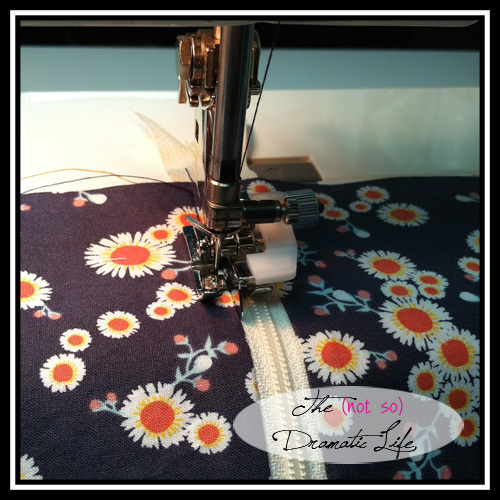 Now that everything is sewn, it is time to add the grommet. 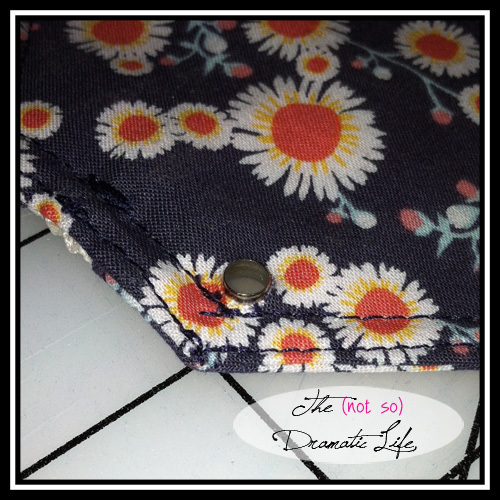 A grommet has two pieces: a grommet, and a washer. You will also need a hammer, punch, and a setter to install a grommet. I used the 00 size for this project. 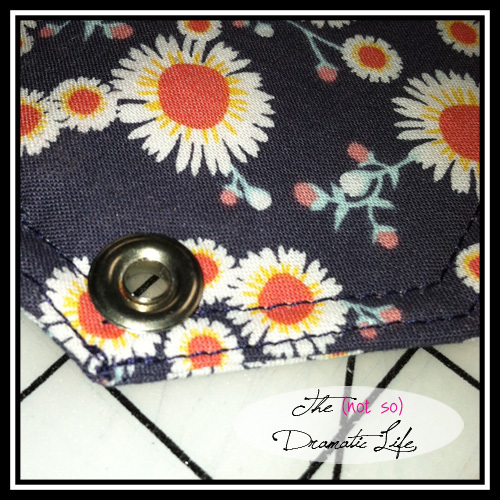 Once you have decided where to place the grommet, lay the pouch on a piece of scrap wood, position the punch, and give it a couple whacks with the hammer. You should now have a nice clean opening to insert the grommet. 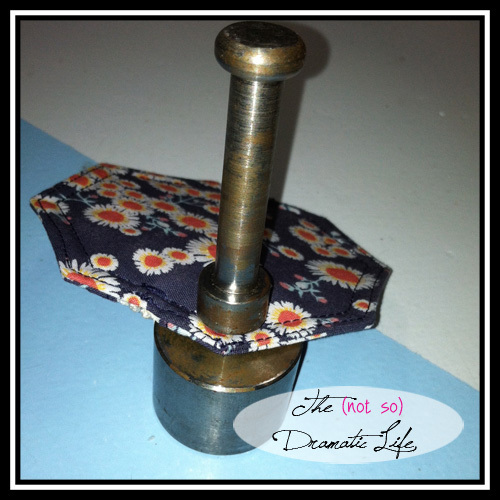 Place the grommet through the hole you punched in the pouch, then place the washer over the center of grommet. The grommet will be placed in the anvil portion of the setter. The setter will fit into the center opening of the grommet (on the washer side), and it should then be tapped firmly several times to set the grommet. You want to hit the setter hard enough to set the grommet, but not so hard that the grommet splits. When in doubt, start with moderate force and increase as necessary. There you have it- A useful little gift that practically everyone will find a use for. I added some candy to sweeten the deal! Finished Pouch, All wrapped up!